Step Xplosion tour returns with FREE performances and workshops in all eight wards of D.C. 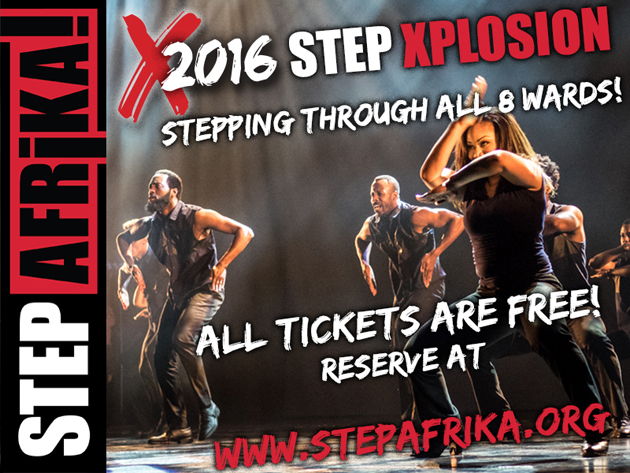 Step Afrika!, Washington DC’s largest African-American arts organization, is kicking off its season with the fourth annual Step Xplosion tour. Step Afrika!’s critically-acclaimed dancers will be providing free workshops and performances in all eight wards of the District of Columbia. The tour launches on August 24, at THEARC Theater in Ward 8 and culminates at Raymond Recreation Center in Ward 4 on September 10. In addition to Step Afrika!, the Grand Finale at Raymond Recreation Center will feature DJ Beauty and the Beatz, the Brothers of Omega Psi Phi Fraternity, Inc., Dem Raider Boyz, the Lady Raiders, Quadrew, and more. Feature-length Performance by Step Afrika! Learn how to STROLL/STEP with Step Afrika! Lunchtime Performance by Step Afrika!